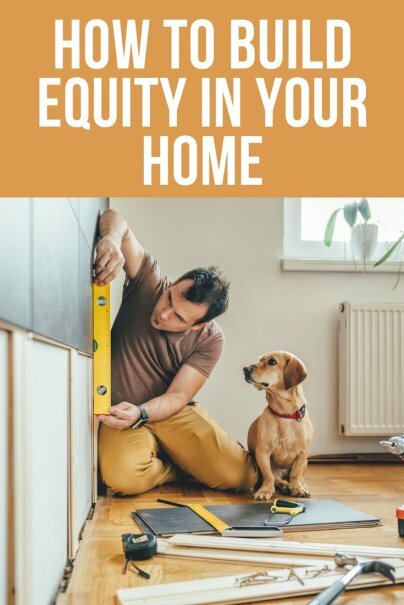 Equity is the difference between what you owe on your mortgage loan and what your home is currently worth. Say you owe $150,000 on your mortgage and your home is worth $200,000. You now have $50,000 worth of equity built up in your home. Congratulations! You can also tap your home's equity for home equity loans or home equity lines of credit. Maybe you want to remodel your bathroom. If you have enough equity, you can take out a home-equity loan of, say, $20,000 to pay for it. You can also rely on home equity loans to pay for a child's college tuition or pay off high-interest credit card debt. And if you ever want to refinance your mortgage loan to one with a lower interest rate, you'll usually need equity to do so. Most lenders won't approve a refinance unless you have at least 20 percent equity built up in your home. So how do you build equity? Mostly by making your mortgage payments on time and hoping that the value of homes in your local housing market continues to rise. Every time you make a mortgage payment, you'll gain a small bit of equity, as long as your home's value isn't falling at the same time. But don't think that if you are paying $1,500 each month, you are gaining $1,500 worth of equity with every payment. Not all of your monthly payment goes toward reducing your mortgage's principal balance. There's something known as PITI, which stands for principal, interest, taxes, and insurance. This means that a portion of each of your mortgage payments goes toward paying off your loan's principal balance, interest, property taxes, and homeowners insurance. Only the portion that goes toward paying off your principal helps you build equity. In the earliest days of your payments, a greater chunk of your mortgage check will be used to pay off interest. The deeper you get into your mortgage's life span, the more principal you'll pay off with each payment — and the more equity you will gain. When you buy a home, you hope that its value will continue to increase. If your home does rise in value, the equity you have will automatically increase. If your home is worth $200,000 and you owe $190,000 on your mortgage, you have $10,000 in equity. But if your home's value was instead $210,000, owing that same $190,000 would leave you with $20,000 worth of equity. Just be aware that your home is not guaranteed to rise in value. If you are using a mortgage to finance the purchase of a home, you'll usually have to come up with a down payment. With some loan products, that down payment can be as low as 3 percent of your home's purchase price. For a home costing $200,000, a down payment of 3 percent comes out to $6,000. Taking out a loan with a shorter term means larger monthly payments. But it also means that you'll build your home's equity at a faster pace. If you take out a 15-year, fixed-rate mortgage instead of a 30-year, fixed-rate loan, your monthly payment will be significantly higher because you are stretching out your payback period over a smaller number of months. But that larger monthly payment also means that you'll be reducing your mortgage's principal balance by a greater amount each month, something that will help you build equity much faster. This is one reason why, if you can afford the larger monthly payment, a shorter-term mortgage is a smarter financial move. Just be careful not to take a shorter-term mortgage if the monthly payment will be a struggle. You can increase the speed at which you gain equity by making larger mortgage payments each month, as long as you tell your lender that you want this extra money to go toward paying down your loan's principal balance. If you owe $1,700 each month on your mortgage, you might instead send a check for $1,900, with the extra $200 allocated to paying down your principal. Your lender's mortgage statement probably has a line that you can fill out stating that you want your extra money to go toward principal. Make sure to fill that out.